As part of a church young women’s project this fall, I have been teaching MiddleK how to can. We started with Applesauce, then promptly proceeded to eat almost all of it over that next week, which kind of defeated the “storage” role of canning. But it had been a long time since we’d had homemade applesauce around here, and I was glad to see the kids asking for that for a snack instead of chips or candy. So we bought A LOT more apples, and made LOTS more applesauce. 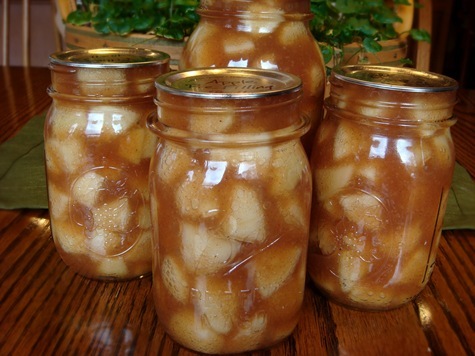 With all of our apples we also made this Apple Pie Filling. Middle K also wanted to learn to make her own piecrust for her pie filling, and while the family waited for her to finally make a pie, we ate the pie filling stirred into yogurt, as an ice cream topping, or when no one was looking: straight from the jar. Yesterday, Middle K, under extreme pressure from her siblings, found the time to create this beautiful apple pie. She made the crust all on her own, and she did a fabulous job! This canned apple pie filling is chock full of apples in a cinnamon brown sugar syrup. When choosing apples for pie, you want to choose a variety that does not get mushy when cooked, and is not overly tart, or you will need to add a lot more sugar to the syrup. 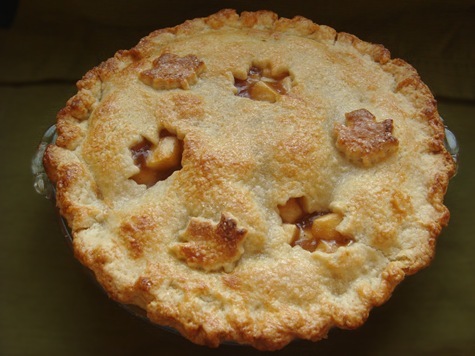 We really like eating Granny Smith apples around here, but I don’t usually use them for pies, unless it is in combination with some sweeter varieties. I also like to use a combination of apple varieties, when possible. Then the different textures of the apples makes a nice balance in the pie. For this pie filling we used a combination of Golden Delicious and Fuji apples. When making the apple pie filling, you can thinly slice or dice the apples. I like to dice them because they fit better in the jars and are a nice size for biting in a pie. The chopped apples are mixed with apple cider, sugar and spices, and left to macerate for an hour or more before cooking. This helps release some of the juice from the apples and helps meld the flavors. We kept the spices simple in our batches this year: just cinnamon and a little bit of nutmeg. For a more heavily spiced pie filling, you can add cloves, ginger and/or allspice. The one special ingredient that you need for making canned pie fillings is Clear Jel. 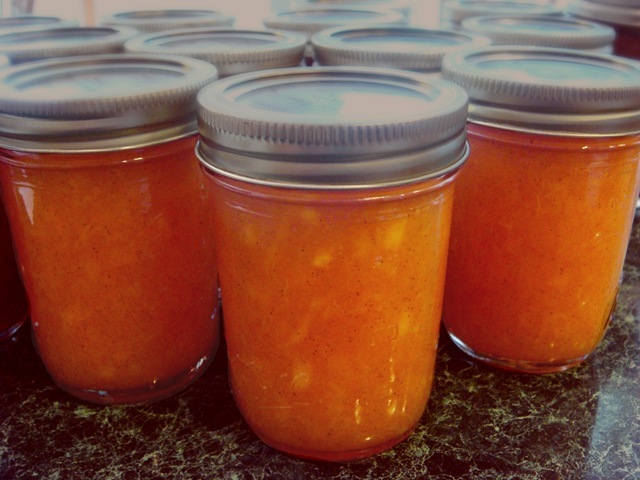 Clear Jel is a modified corn starch made specifically for canning. It is a thickener that will not loose it’s texture or become grainy after being cooked more than once (first while preparing the filling and processing the jars and then again when you cook the pie). I buy mine from a company called Walton Feed. I like that I can get sealed cans. Clear Jel is also available in bags from Amazon. One problem that we did run into on a couple of our jars was “siphoning”. This is when some liquid from inside the jars seeps out while processing, or immediately after being removed from the canner. The filling is still safe to eat as long as the lid seals, but it does make for kind of a sticky mess and an increased likelihood that the jars won’t seal properly. We left 1” headspace on the jars before processing, but next time I will leave 1 1/4”. After doing some reading, another way to reduce siphoning is to leave the jars in the boiling water bath (with the heat turned off and the lid removed) for about 10 minutes after fully processing them. I will try this next time around. Supposedly, the drastic temperature change from the boiling water to the outside air can often cause siphoning. Pie filling is the only thing I have ever had this problem with. Luckily, all of our jars sealed, but I did mark the ones that had the siphoning problem so that we could eat those jars first. When making a pie from canned filling, you simply prepare your bottom crust, pour in the filling, add a top crust or streusel topping and bake (for about 45 minutes at 400°F). 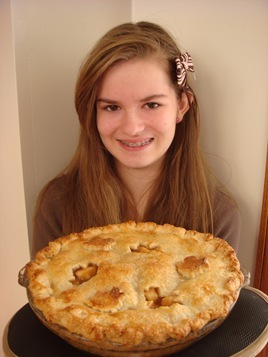 A regular 8”or 9” pie plate will use one quart jar. For deep dish pie plates (which I have), I use one quart jar and one pint jar. So I can both quart and pint sized jars. You could also just use 1 1/2 quart jars and use the other half jar as ice cream topping. In a very large bowl, mix together 3 cups apple cider, sugars, lemon juice, vanilla, salt, cinnamon, nutmeg and optional spices (if using). Peel, core and coarsely chop or slice apples. 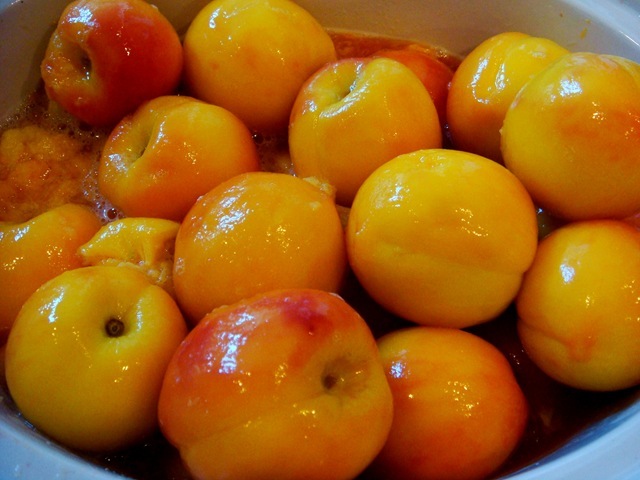 Place apples in cider mixture as you cut them. Allow apples to sit at room temperature for at least 1-3 hours, stirring occasionally. 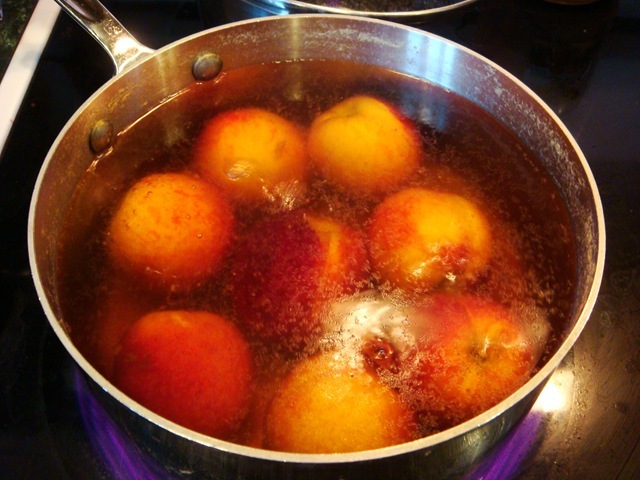 Strain juice from apple slices into a large pot. Bring to a boil over medium-high heat. Reduce heat to low and simmer for 5 minutes. In a small bowl, mix additional 1 cup of apple cider with the Clear Jel; stir into the cider mixture simmering in the pot. Return to a boil and cook until the juice has thickened, about 1 – 2 minutes. Stir in apple pieces with any remaining juice in the bowl. Return mixture to a boil, lower heat and simmer for 5 minutes. Ladle hot pie filling into hot jars, leaving 1 1/4” headspace. Use a spatula or knife to remove air bubbles. Make sure that your apples are covered by the syrup. Wipe rims with a clean, damp cloth, place lid and ring on the jars, and process in a boiling water bath for 25 minutes for quart or pint jars. After processing, turn off heat and remove the lid from the canner, but allow the jars to sit in the water for 10 minutes before removing. This will help reduce siphoning (liquid seeping out of the jars). Remove jars from water and place on a clean, dry towel on the kitchen counter. Let sit for 24 hours. Check seal, remove rings and store. **For best results use a mix of Golden Delicious, Fuji, McIntosh, Jonagold, Rome, Jonathon, Cameo or Gala. 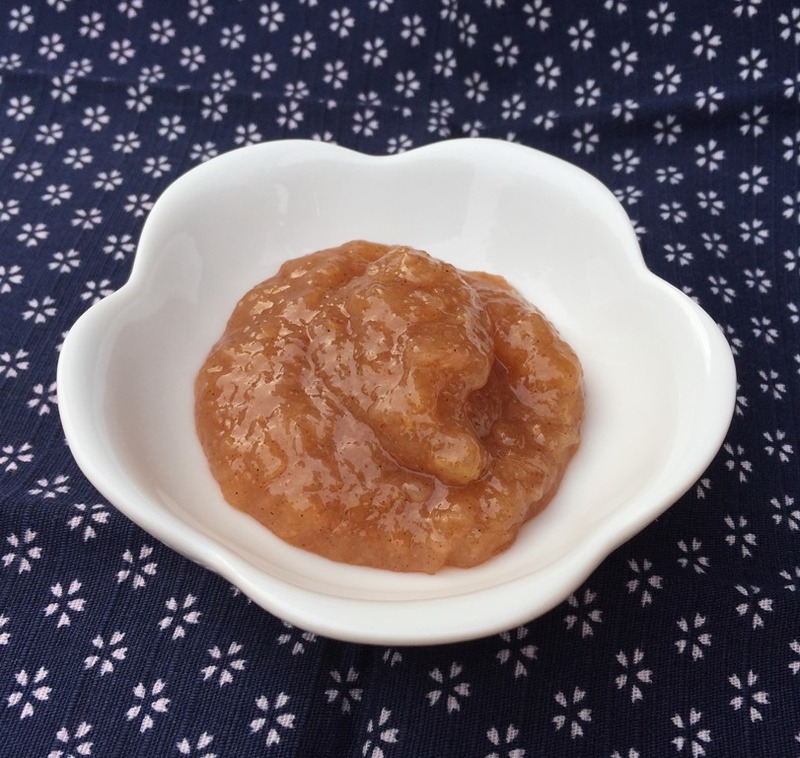 Canned pie filling can be used to make apple pies, tarts, or apple crisp. Or spoon it onto ice cream or yogurt. I like to use this All Butter Pie Crust. 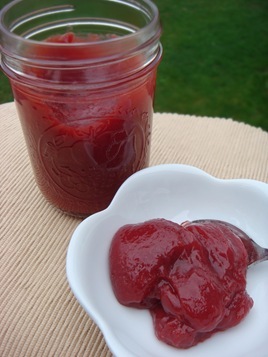 One of the kids’ favorite jams from last year was this Raspberry Nectarine Freezer Jam. This year I played with the recipe a little, to reduce the sugar and to make it a regular canned jam (freezer space is precious!). Nectarines and raspberries are a great combination! Be sure to leave the nectarine peels on when cutting the nectarines. They help give the rich color to the jam. They will be strained out later with the raspberry seeds. Pressing pulp through a sieve to remove seeds is not my favorite thing to do. It is a lot of work, and it seems like such a waste to not use all of that good stuff. I don’t mind having raspberry seeds in things, so I save the seeds (and pulp that clings to them) in the fridge and add them to smoothies, or stir some into my oatmeal in the mornings. A little extra fiber is never a bad thing, right?! Combine nectarines and raspberries in a blender or food processor. Process until smooth. Press through a fine sieve to remove seeds; discard seeds. Place fruit puree in a large saucepan with the lemon juice. 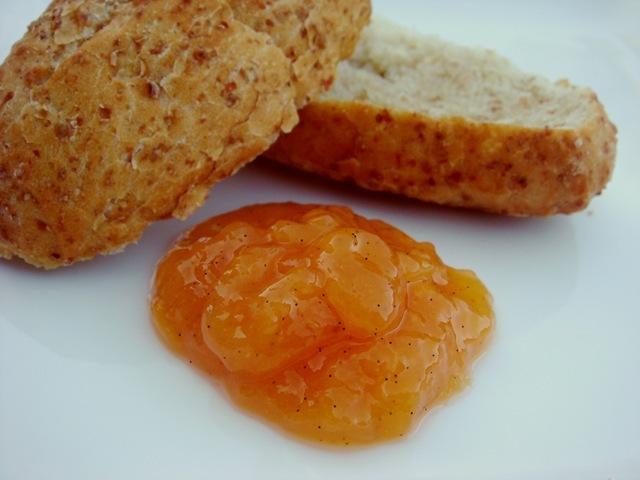 In a small bowl, mix ¼ cup sugar with pectin. Stir into fruit puree in the large saucepan. Bring to a hard boil (boiling doesn’t stop when stirred) over high heat. Stir in 1 C sugar and stevia. Return to hard boil; boil 1 minute. Remove from heat. Skim foam. Ladle into jars, leaving 1/8” headspace. Wipe rims of jars. Place lids on jars. Place in a boiling bath canner or steam canner. Return water to a gentle boil. Process 10 minutes. Cool on a towel on kitchen counter for 24 hours. Check seal. We also made three different raspberry jams, two regular raspberry ones that I will share today, and a seedless variety with nectarines for tomorrow’s post. 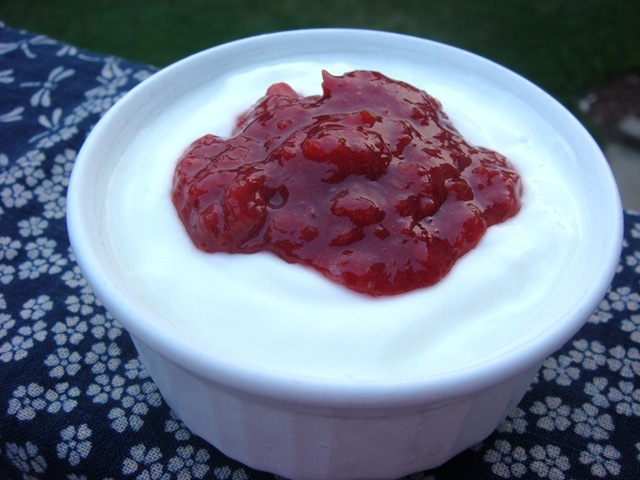 The first jam is a low-sugar red raspberry jam. I love how the fresh fruit taste shines in low-sugar jams, but they do have more of a fruit-spread consistency than the jelled set of full sugar jams. I make most of my jams with stevia as a sweetener. I use a little bit of sugar to help with the consistency and “sheen”, but most of the sugar I trade out for stevia. 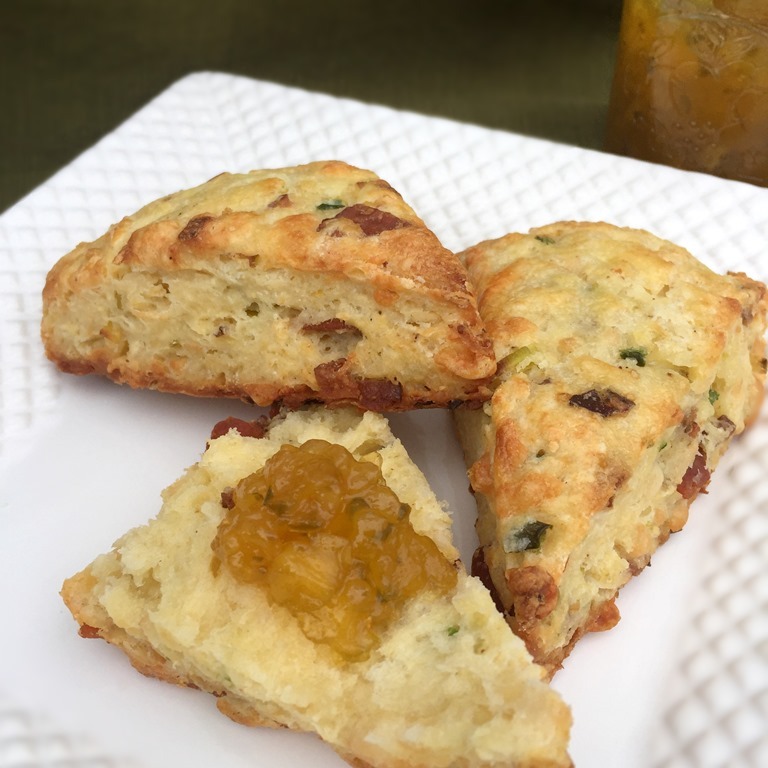 Stevia comes in many brands and forms (liquid: plain and flavored, powdered extract, “spoonable”, packets, crushed leaves), so you will need to do a little experimenting (i.e. tasting) to get the amounts just right. I use the Sweet Leaf brand most of the time. In the past I have always used the powdered extract, which I highly recommend. This year I tried using their Vanilla Crème flavored liquid variety, and I really liked it. 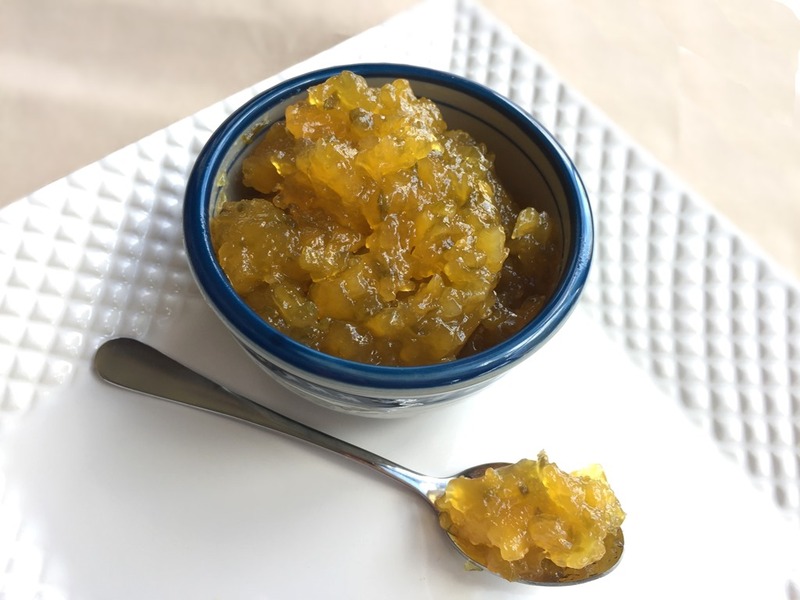 When making low-sugar jams, be sure to use the “no-sugar needed” pectin. For the SureJell brand, this is the pink box. 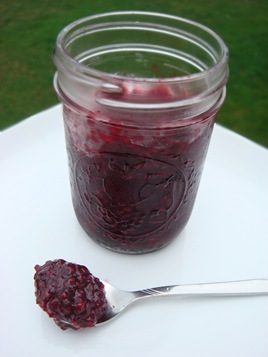 The second jam we made uses red, black and yellow raspberries. 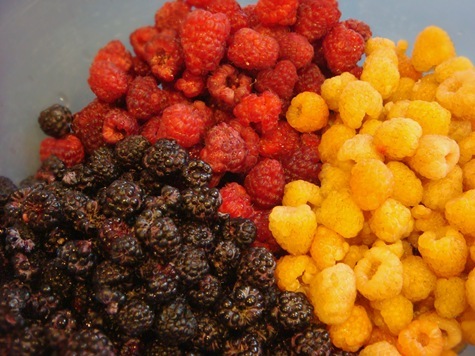 Black raspberries are smaller than the other colors, and have more a few more seeds. Their flavor also seems more concentrated. They make for good finger-staining when you are picking them! And teeth staining when you eat them. I actually prefer their taste over the red ones. I made jam from just the black raspberries a few years ago, and it came out extremely thick (hold the spoon upside-down thick). So now I combine them with the red and yellow berries to get a better consistency. 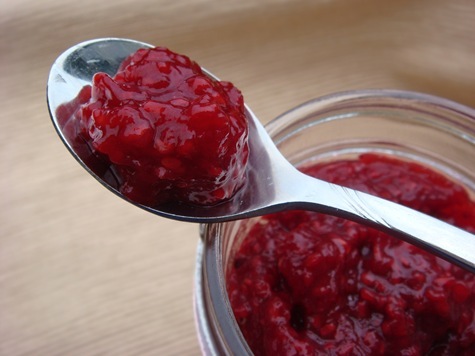 I don’t mind seeds in my raspberry jam, but if you prefer to make it seedless, start with about 1/2 cup more berries, and press through a sieve before adding pectin. 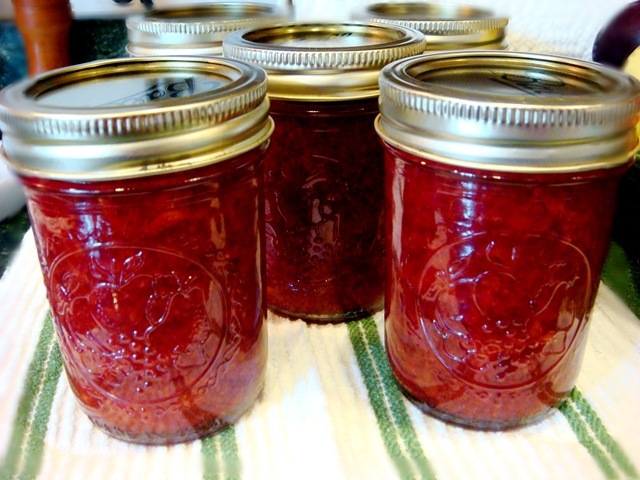 If you want to make full-sugar jams, use the same amount of berries, regular pectin and 7 cups sugar (some recipes call for as much as 8 1/2 cups sugar). 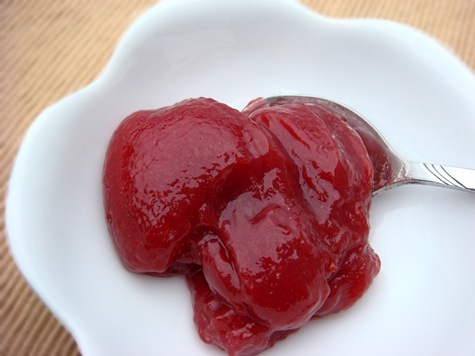 In a small bowl, mix ¼ cup sugar with pectin. Stir into raspberries in a large saucepan. Bring to a hard boil (boiling doesn’t stop when stirred) over high heat. Stir in 1 cup sugar and stevia. Return to hard boil; boil for 1 minute. Remove from heat. Skim foam. Ladle into jars, leaving 1/8” headspace. Wipe rims of jars. Place lids on jars. Place in a boiling bath canner or steam canner. Return water to a gentle boil. Process for 10 minutes. Cool on a towel on kitchen counter for 24 hours. Check seal. Using a sharp paring knife, peel three or four strips of lemon peel from the lemon. Skin should be about 1/2 inch wide and not have too much of the bitter pith or white part on it. Then juice the lemon, and set both zest and juice aside. Place blueberries and 1 cup of the water in a medium pot. Don’t worry about stems or leaves; they will be strained out later. Using a potato masher, crush the berries. Over medium-high heat, bring the berries and water to a boil, then lower the temperature to medium-low. Simmer berries for 15 minutes, stirring occasionally. They will darken considerably. Remove pot from heat and ladle berries into a fine sieve set over a heat-proof bowl or measuring cup. Using the back of a ladle, press on the berry solids to extract as much juice as possible. Discard solids. Wash out your pot, then add the remaining 2 cups of water, lemon peel(not juice yet), and the sugar. Bring to a boil and boil rapidly for about 15 minutes until the mixture thickens (or reaches 225°F). Add reserved blueberry juice and 2 tablespoons lemon juice and stir to combine. Boil another minute or two. Remove from heat and allow to cool. Remove lemon zest. Using a funnel, pour syrup into clean jars. Top with lid and store in the refrigerator for up to six months. Or process in sterile canning jars with a boiling bath canner (Process half pints for 10 minutes; pints for 15 minutes). Sloppy Joes with Baked Beans is always sure to please even the pickiest of eaters in my house. Again it is all about the toppings around here: cheese and sliced green onions go perfectly with the simmered savory meat. 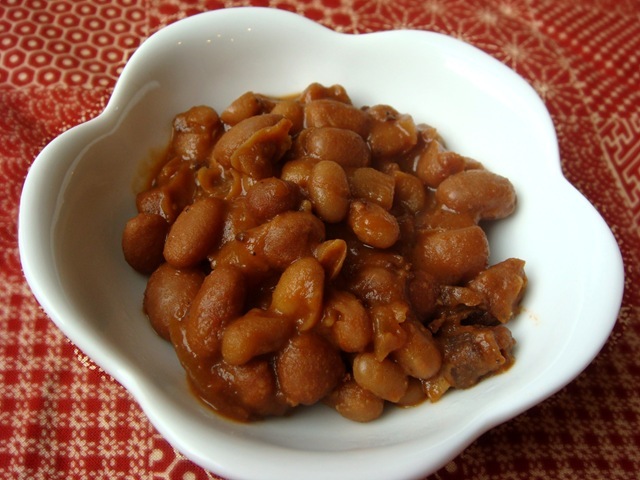 I know that baked beans are traditionally a summer barbecue food, but I prefer to make them when it is cold outside and I need to heat the house up with some extended oven baking time. I usually start with canned beans because I am rarely successful in getting good finished texture when cooking this with dried beans. Want the convenience of canned beans at the price of dry beans? Can your own with a pressure canner: 1 cup beans + 1 tsp salt in each quart jar. Add hot tap water, leaving 1” headspace. Process in a pressure canner at 15 lb pressure for 60 minutes. Brown ground beef in a large skillet until thoroughly cooked; drain fat. Add onion, red or green pepper, garlic and parsley to the skillet. Cook until onions are translucent. Add remaining ingredients (except buns and toppings) and simmer, covered, for 15-20 minutes. Uncover and continue to simmer for an additional 10-15 minutes, or until Sloppy Joes are thickened as desired. 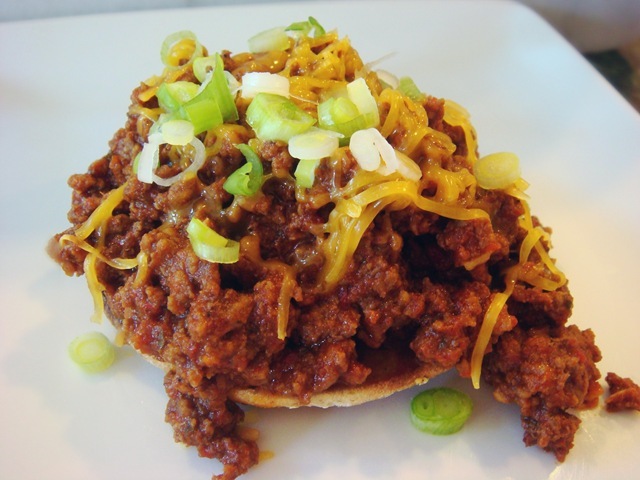 Serve over toasted buns (open-faced or full buns) with shredded cheese and onions for toppings. **NOTE: Use a food processor to chop the onion, peppers, garlic and parsley if you want fine pieces that are less noticeable to children! Chop bacon and cook until almost crisp. Remove bacon from pan; drain grease, leaving 2-3 Tbs drippings in the pan. In the bacon drippings, sauté onion until soft. Combine bacon and onion with remaining ingredients in a 2-quart baking dish. Cover and bake at 300°F for about 3 hours (or 325°F for 2 hours), stirring every 30-45 minutes. Add additional water if the beans begin to stick to the pan. Or cook in a crock-pot on low for 6-8 hours. Roasted garlic adds a wonderful flavor to many dishes: salsa, steamed or roasted vegetables, grilled meats, soups & stews, pastas, mashed potatoes, garlic bread. 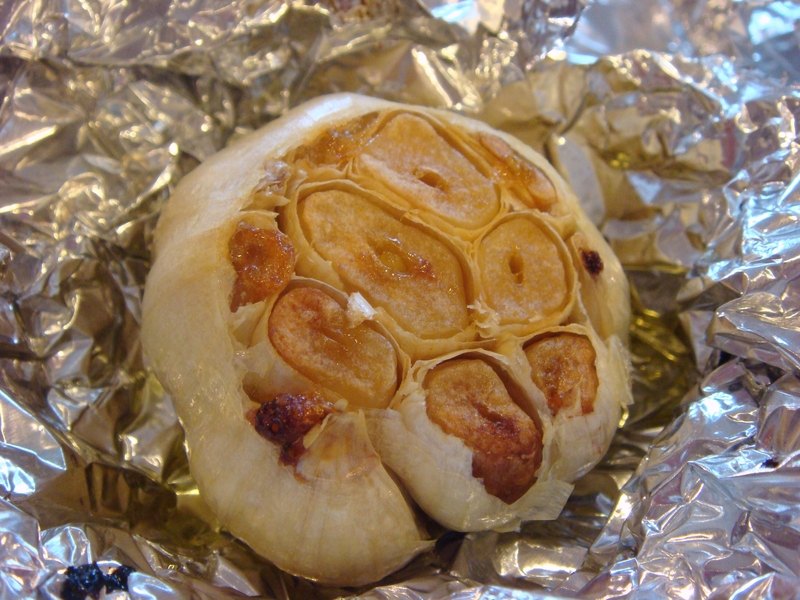 Roasting garlic is easy to do (much easier than peeling raw cloves), and can be done with either whole heads of garlic, or individual garlic cloves. Using a knife, cut off the top of the head of garlic (about 1/4 to 1/2 inch), just enough to expose the individual cloves of garlic. 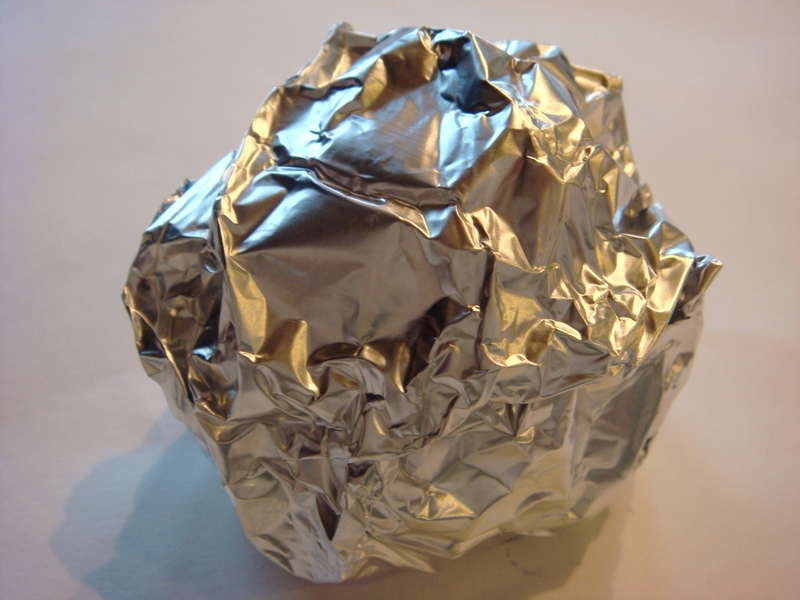 Place garlic head on a square of aluminum foil (Large enough to wrap around garlic head). Drizzle each cut garlic head with about 1 Tbs olive oil. 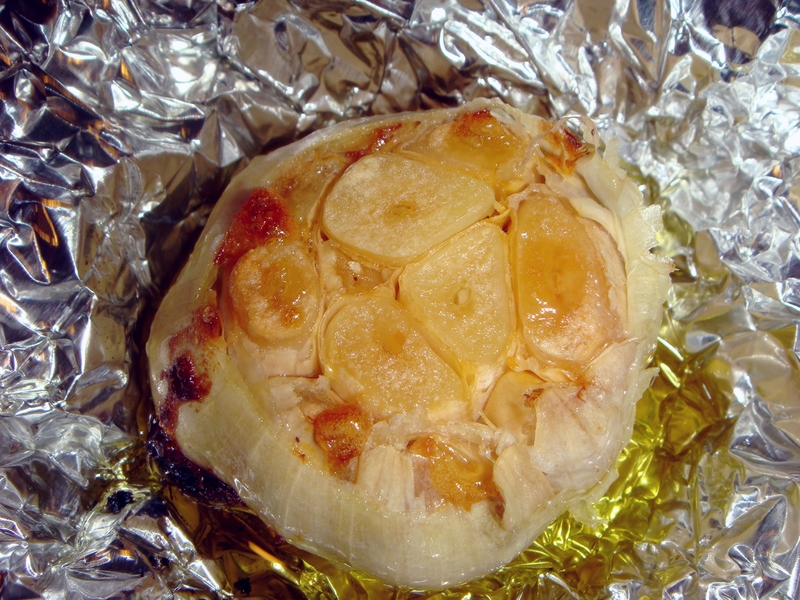 Wrap foil around garlic head and place on a baking sheet. 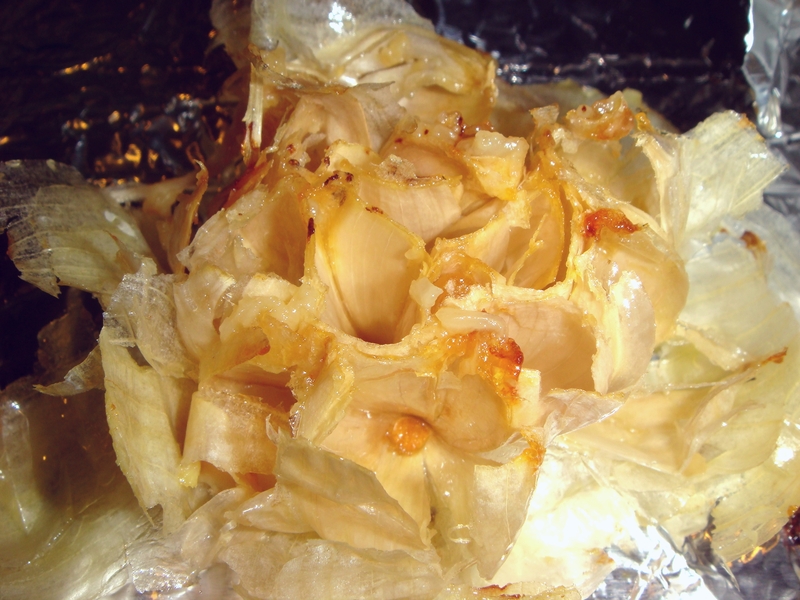 If you are doing a large number of garlic heads at the same time, you could also line a rimmed baking sheet with foil, place garlic heads in the pan and then cover the entire pan with foil, instead of wrapping each garlic head. Bake at 400°F for 30-40 minutes. The garlic cloves should be soft and slightly browned. 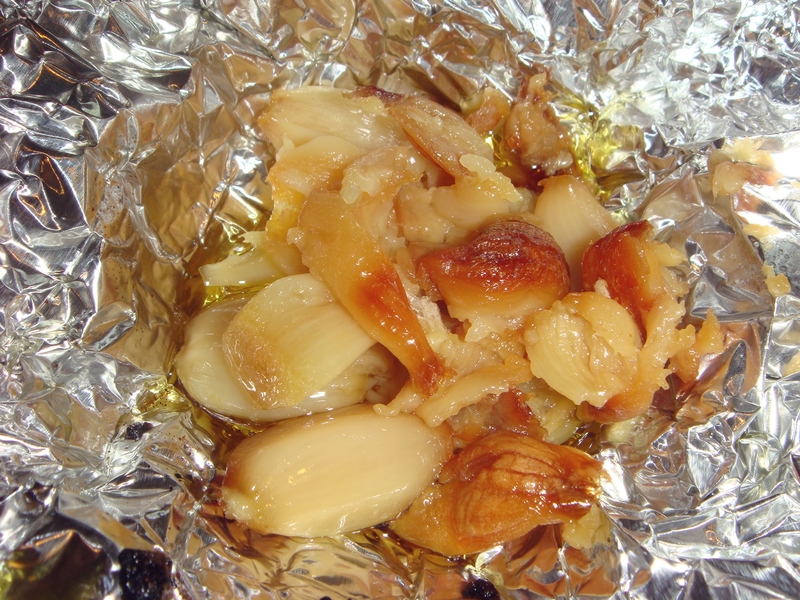 Remove foil, and let the garlic cool slightly. Use the tip of a knife to remove garlic cloves from skins. 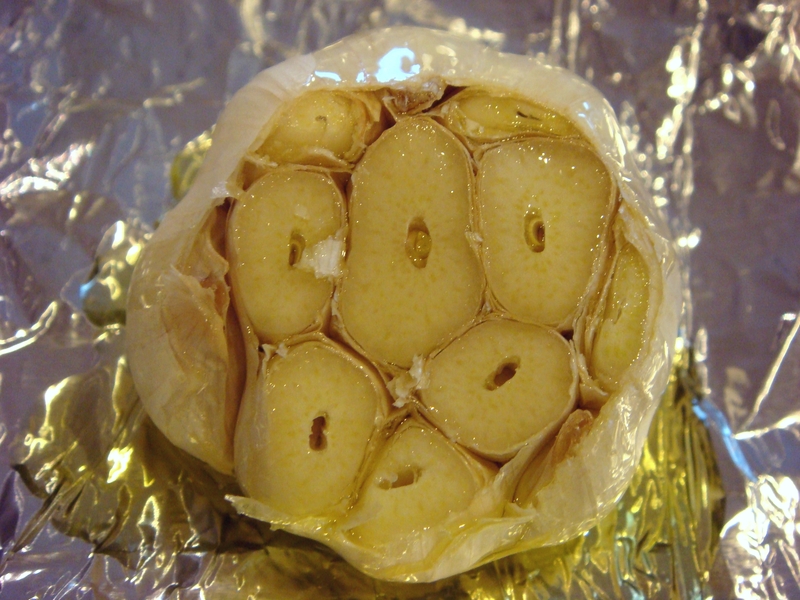 If the cloves are soft enough, you can also gently squeeze the individual cloves out of the skin of the garlic head. I definitely can’t use this much garlic before it goes bad, and it really makes the refrigerator reek of garlic. Unless you freeze the whole bag! This has been a perfect solution for me. I throw the entire bag in the freezer (before ever opening it), and then pull out as many cloves as I need for a recipe. They thaw quickly just at room temperature, but you can also microwave them in a small bowl for about 10 seconds, if time is short. 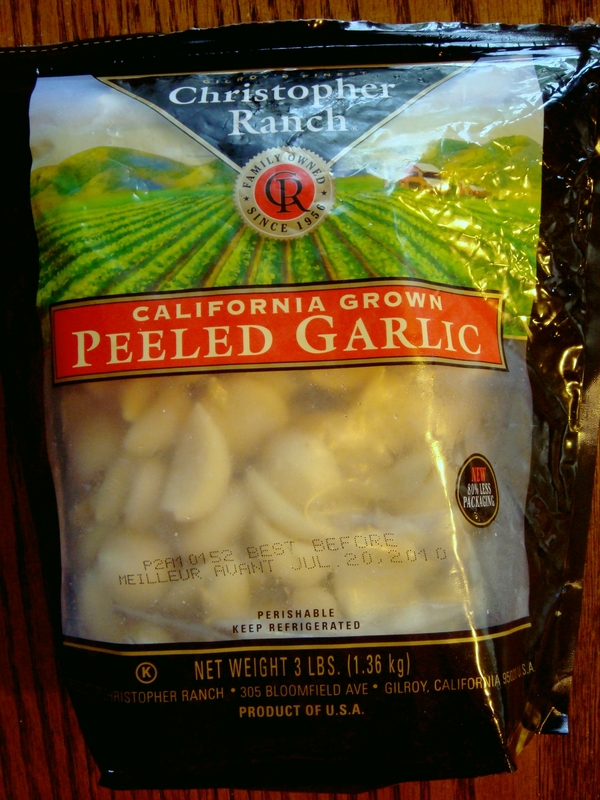 No more peeling garlic! These cloves also work perfectly for roasting. 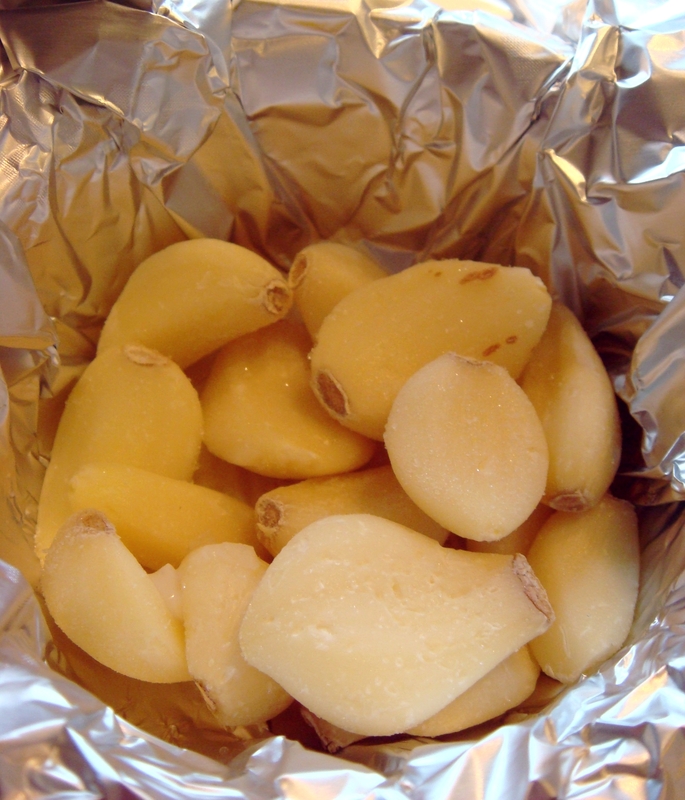 Place as many cloves of garlic as you want to roast in a small foil-lined oven safe bowl (like a ramekin). Or use a muffin tin if you want to do a lot at a time. 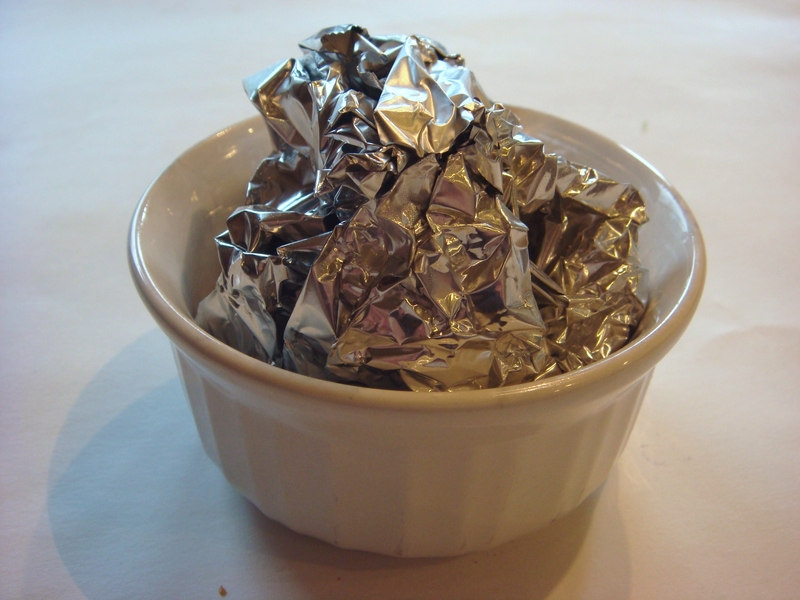 Drizzle with olive oil (about 1 Tbs for 10-15 cloves) and wrap foil around cloves.